Two days spent in troubleshooting a point to point link with lot of hops between them. I stumble to see one weird thing that whenever the mux sfp port is connected to the router, the router card starts rebooting. This is the case not with a single router but with the multiple ones. We changed everything but all in vein. At last we able to catch a little point about mux which is using layer 2 switching and forwarding vlans traffic to the router directly. The broadcast was so huge which forces routes card to halt. 3G is one of the best way to connect human network. For me 3G will open the doors to connect me swiftly over remote and reach anywhere in the world with no delays. It is not only opening doors towards the bandwidth but also giving new opportunities to vendors. By using 3G, one can surf fastly and by subscribing skype or gtalk, drastically reduce the phone bills. I am feeling personally, 3G will drastically boost our house business. If all our clients would have 3G, then we can present the realtime demo of any of the product live. Earlier it is not like that. Most of time I keep on travelling, by using 3G anytime I can see my friends and family members without any constraints. Stumble to see about Twitter website message telling about its overcapacity. Finally Cisco has made an announcement for the newer CCIE SP Version 3 which will be starting by 18th April, 2010. The newer version is having lot of changes w.r.t to version 2. Carrier Support Carrier is also known as Inter-AS communication some times (but both are different) and it is well defined in three options. Out of three I am working on option A which is back to back vrf model. Inter-AS communication is required when the same customer is having the few location in one service provider cloud and few locations in another service provider cloud. Customer’s objective is to access all the location in MPLS cloud, no matter where there are. To achieve the objective, both service provider need to do a mutual contract to serve the customer. In the depicted figure, PE-2 and PE-3 are the edge routers of both service provider cloud and are connected over fast Ethernet link. In this scenario, I am using different VRFs name and with different RD values. One is VRF BLUE with RD 1:1 and another is vrf MPLSVPN with RD 2:1. CE-1 access CE-2 20.20.20.2 network which travels from AS-1 to AS-2. But for customer it is end to end a single MPLS network. Back to back vrf is created on PE-2 and PE-2 with name BLUE and MPLSVPN. 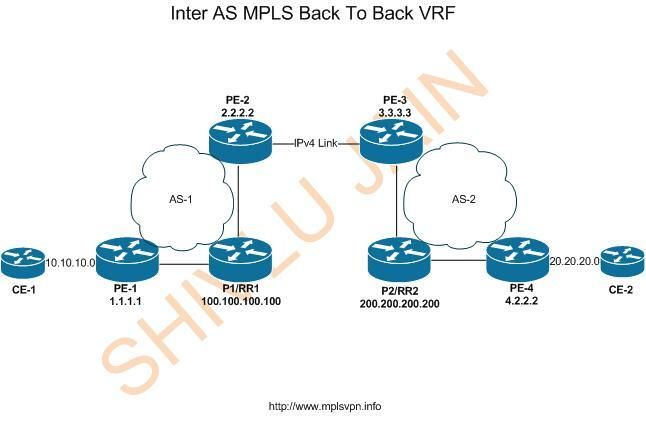 Reverse Routes for the remote lan of different service providers by point next hop of back to back vrf interface ip address. Now see how the labels forwarding will work in back to back vrf model. CE1 sends a packet with destination 20.20.20.2 towards PE-1. Given is the output on PE1. Now PE-2 will receive the packet with only VPNv4 label and perform the no label on it. After that it will send the packet to PE-3. PE-3 will receive the pure IPv4 packet and put that packet in MPLVPN vrf. Then it creates a label stack with VPNv4 label of 20.20.20.2 along its next hop IGP address. Label 17 is for IGP next hop i.e. 4.4.4.4 and label 20 is VPNv4 label. It will forward the packet to P2 with the label stack 17 and 20. P2 will perform the penultimate hop popping for 4.4.4.4 and forwards the packet to PE-4 with only VPNv4 label i.e.20. PE-4 will receive with only label 20 and will that the label belongs to MPLSVPN vrf. In my previous post, I have shown how to manually configure control VC at LC-ATM interface. In this post, we will see how we can manually configure the VPI/VCI in MPLS ATM networks. This is mainly used at that time when SP doesn’t want to add the individual entries at each time for customers. By using command “mpls atm vpi 10 vci-range 33-100”, we actually tell the router to use LVC for these VPI/VCI values. Encapsulation type will be used as MUX because these VPI/VCI values are used for MPLS datagram’s. Make sure both the commands are used in both ends. In Cell Mode MPLS, ATMLSR is also responsible for participating in LDP/TDP with the adjacent neighbor routers. Edge ATM routers are connected with LC-ATM (Label Control) LSR routers over LC interface. Cell mode MPLS uses VPI/VCI field in the ATM header as label value. Cell Mode MPLS uses downstream on demand for label propagation. In the above configuration, default VPI/VCI values are used. To check the VPI/VCI values, run “show atm vc” command on LC-ATM Edge router. The other LVC uses VPI/VCI values are 1/33, 1/34, 1/35,1/36 and 1/37 with encapsulation MUX. The LVC uses MUX encapsulation because they carry MPLS datagram.